Heat oven to 400°F. In 8-inch nonstick skillet, cook bacon 5 to 7 minutes over medium heat until crisp. Transfer to bowl using slotted spoon. Reserve 1 tablespoon bacon drippings for greasing muffin cups. Meanwhile, in large bowl, beat eggs with whisk. Beat in milk. Beat in flour and salt until smooth. Stir in thyme. Generously grease 12 regular-size muffin cups with reserved bacon drippings. Place muffin pan in oven 5 minutes. Carefully remove pan from oven. Divide batter evenly among muffin cups. 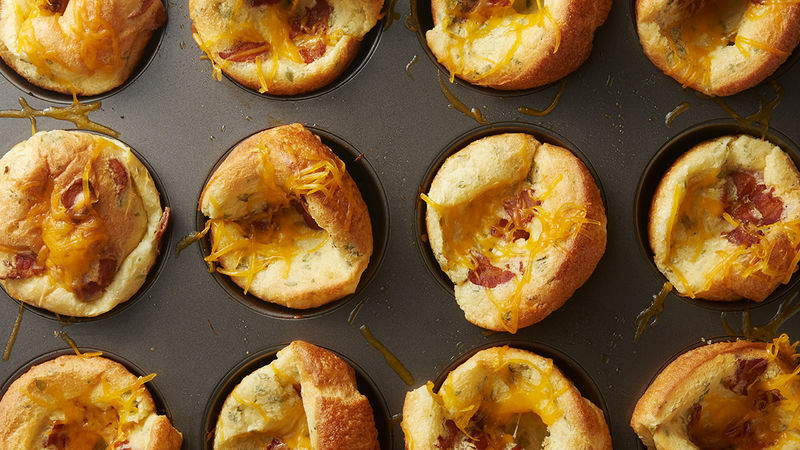 Sprinkle bacon evenly over batter in muffin cups. Bake 27 to 30 minutes or until deep golden brown. Prick top of each popover once with sharp paring knife to prevent deflation. Sprinkle cheese evenly over popovers. Let stand 3 to 5 minutes or until cheese is melted. Be sure to use finely shredded cheese; it melts faster than regular shredded cheese. Need even more decadence? Serve with butter, maple syrup or both!